A fishing combo can be quite a handful for people who don’t want to spend much time choosing their fishing kit. They are very much ideal for beginners. The best thing about a combo is that you don’t have to manually fit in everything, you don’t have to search for the perfect reel for your rod, the manufacturer does that for you. They also generally come with a case for transportation. As far as the price is concerned, they can range from anywhere between a few hundred to literally thousands. Here, we’re going to see the best fly fishing combo under 200 bucks. As we’ve mentioned earlier, there are quite a few combo packs that perform their job but here we’ve shortlisted these 14 fly fishing combos which we believe will satisfy your needs. The Wild Water fly fishing starter package is one of the most popular fly fishing combo available. While it does come with many features like aluminum reel built and graphite design of the rod, it has it’s own share of flaws too. The combo can also be quite expensive if you want to replace the reel because of its inconsistency. There are other features that make up for it like the number of items you get and the rod’s quality. This makes it one of the Best fly fishing combo under 200. 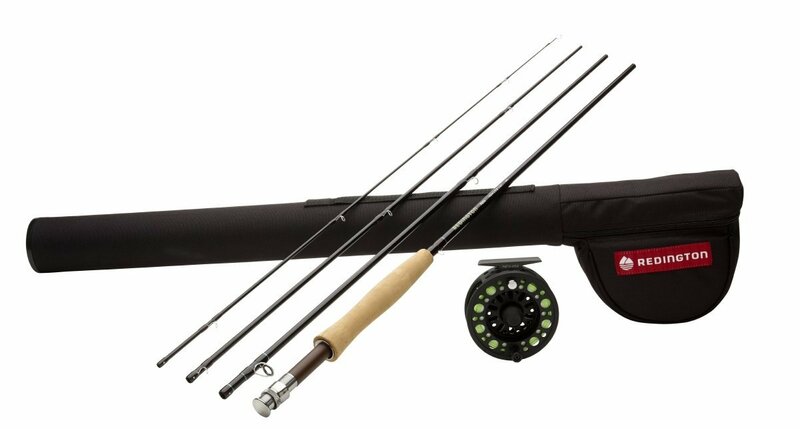 The combo comes with a 9 ft, 5/6 weight, 4 pc rod, large arbor reel, preinstalled line, backing, and leader, a rod sock, a rod case, a fly box, flies, and a detailed instruction book. Includes spare leader, zinger and nipper/knot tying tool. The rod has a lifetime warranty and IM8 graphite design. The combo also has a rod bag, a rod case and a user guide to help you out. Sturdy case with zippered pouch. The Wild Water Fly fishing combo is pretty good overall. The only problem it has is the reel, other than that, it’s a recommendable product. The Anglatech fly fishing backpack-vest combo is a unique combo as it has a fishing gear, more specifically a vest, thrown into the mix. The backpack comes with a lot of space but it is not a standard combo. It doesn’t have a fishing rod or a reel but it does have other items that could be useful for some. There is a lot of storage for you to keep your fishing gear and equipment well-organized and quickly within reach. It has a breathable mesh to provide air flow freely. The Anglatech Fly fishing backpack is basically a backpack that allows you to keep the fishing items. The backpack is designed for fishing and it comes with a lot of storage. It doesn’t have reels and rods though. Still, the price and accessibility of the backpack make it a great purchase. The Wakeman Charter fly fishing combo is a standard combo that comes with a carry bag. The main plus point of this combo is that it is very portable. The fly line is 45 feet long and comes with 2 dry flies. The Wakeman charter series fly fishing combo is good for an affordable combo with a minimalistic built and less number of items. It is the go-to combo kit for a beginner. The only thing that is missing is the warranty and the reel’s built which is stainless steel i.e, it’s prone to corrosion. As the name suggests, the FISHINGSIR Fly starter kit is just that, a starter kit. It includes everything you can think of and then some. The quality is also not bad. Although, it has one or two downsides to the actual performance. The fly reel is also pretty good with a large arbor. It has a disc drag system. The fly line of the combo has a 100 ft weight forward, 9 ft tapered leader, 55YDS 20LB orange backing. The flies are handmade, the pack has 24 pieces of dry, wet and streamer flies. Everything about the Fishfinger starter kit is on point. The reel and rod work like bread and butter. The only downside is that the fly line isn’t something to boast about so, the performance can take a hit here. Other than that, the starter kit is really great for any fly fishing enthusiast. Orvis is a well-known name in the fishing industry. It accounts for some of the best reels and rods in the market and this starter kit is no exception. Although the reel, the line, and the rod is perfect here, one thing it so desperately lacks is the supporting fishing items. There are no flies, no other items that can attract buyers. But, as far as the price is concerned, you get the stuff that is promised. The NetAngler Fly Fishing Combo comes with many items and a really good designed rod that performs well too. The combo is ultra-portable and the reel has a disc drag mechanism with it. The pack includes 1 fly fishing rod + 1 fishing reel + preinstalled fishing line + fishing lures + 1 case. The case holds everything that is included in the package. The fly fishing reel has good line weight, die-cast arbor design, and durable aluminum construction. Although the Net angler fishing rod combo is a pretty good real all thing considered, it does have its fair share of flaws too. The first is that the build isn’t great and the second being that it doesn’t come with a warranty so if the rod or the reel breaks, you’d probably be in a lot of trouble. Aside from that, the performance factor is top notch. The K&E Outfitters is a complete combo with a fly rod, a fly reel, a line, and a fly box. In addition, it comes with a strap and a pouch too. As far as the build and performance are considered, the combo nails it in that department. The rod tube is fully equipped with a built-in rod sock, shoulder strap and a pouch for accessories. The features are no doubt handful, the performance is there and the build quality is sturdy. The only downside is that it doesn’t come with a warranty and that can be a deal breaker for some. The Kast King Emergence fly fishing combo comes with all the necessary fishing equipment as well as some extras that are bound to be helpful. It comes with many accessories and has graphite built fly rod and a reel with an aluminum build. The accessories include; a travel case, 12 high-quality flies and other items such as line nipper with retractor, strike indicators and split shot for use with sub-surface flies. The Kast King Emergence fly fishing combo is meant for both pros and the newbies. It comes with many accessories and a 1-year warranty. The downside is its price. It’s a bit overpriced and the rod setup can be a bit complicated. You do get a user manual to help you with it though. The combo includes; One Fly Rod(9 ft, 5/6 weight, 4 pcs rod), One Fly Reel(size:5/6), 100FT Fly Line, backing and leader, One-rod case, One fly box, 12PCS flies, spare leader, zinger and nipper, One Carrier Case. The rod is manufactured from carbon fiber, it is durable and lightweight. The reels have a metal adjustable seat and IM8 graphite design. The Sougayilang fly fishing rod reel combo has the reel best suited for predatory fishes and it comes with a 5-year warranty. It has decent features and affordable pricing. The letdowns are the reel built and the fly line’s performance. The Redington Path II outfit comes with fishing rods and a Crosswater reel. The overall performance of the rod-reel combo is pretty good given the price. Since Reddington is a well-known name in the fishing kit industry, this combo is sure to impress many. Although the combo is a product from Reddington, it doesn’t have a warranty. More crucial, the build quality of the rod isn’t even better. That leaves a lot to be desired. However, the performance part of the combo is a sweet deal. The Piscifun New Fly fishing rod combo comes with many items that might be helpful for you. It includes pretty much all the necessary items for fly fishing. The fly rod combo includes the following items; A 4-piece 5/6wt 9-foot rod, a mid arbor reel with drag, pre-spooled line, backing and leader, a carrying rod case, a zinger retractor, a fly box, 3/4 dozen of 3 different fly pattern and a stainless steel line cutter. The rod is a super light one and it has a slow action that will help you catch sunfish, small trout and small streams. It has a lot of extra accessories as well, The included Stainless Steel line clipper is also easy to carry. The one thing that the Piscifun New Fly fishing rod combo isn’t is minimalistic. The combo comes with many accessories that you might not even want. The one main downside, however, is that you don’t get a warranty. Apart from that, the combo does its job in quite a great way. The Maxcatch Extreme Fly Fishing Combo by M MAXIMUMCATCH has a list of items that could really be beneficial for you. In addition, it comes with a reel that has an aluminum body and a rod made out of IM6 Graphite. Other accessories include; one forceps, one leader straightener, one line nipper, one zinger. Also has an extra tapered leader just in case. Although, the combo has a lot of accessories, is available at a reasonable price and the built is great, the same cannot be said for the performance. Another downside is that there isn’t any warranty here but we guess the build quality covers it. As the name suggests, the Pinty all-in-one fly fishing combo has everything related to a fly fishing kit at one place. It comes with a rod, reel and a fairly good selection of flies. These are the main things that you need to flyfish and you get all that on a relatively affordable package. The rod has a carbon fiber built, it is extra lightweight. The Pinty all-in-one fishing combo is a 50-50 in the rod-reel department. It has a great reel but not so great rod. You do get a carry case and flies though. The price also plays a role here. You wouldn’t get something better than this at the given price point. The Goture Fly fishing combo has its share of items and it comes with a great reel. The flies included are handmade and it has an easier casting. That doesn’t make it exempt from criticism though, as there are quite a few flaws here. The combo has the following items: 4-piece 9 feet 5WT fly fishing rod; A 5/6 fly reel; A complete fishing line set: WF5F line, backing, leader and tippet; 16 pieces of flies with a fly box; An instruction manual; A fly combos bag. The rod is high performance with a carbon Fiber built. The Goture Fly Fishing Combo is meant for beginners and it has an acceptable rod performance. But the rod itself is a carbon fiber built which is just another name for plastic. It is really fragile and since the combo doesn’t have a warranty, it will be a huge deal breaker for some. Apart from that, the reel and rod performance is great. The reel has an aluminum built which makes it durable. Fishing On The Fly - Misc. The core of any combo is the rod and the reel. You need to get a reel with an aluminum build and the rod with either aluminum or stainless steel built. Carbon Fiber which is a fancy name for plastic is a big NO. Also, the performance can be judged by reading reviews about the combo. Do this and you won’t regret your decision. You don’t need 100 items in a combo. But you would need quite a few of them. Some combos don’t include some important items while others do. So, be very careful. See your needs and buy a combo which has everything you need. Warranty plays a huge role as far as the combo’s lifespan is concerned. The warranty is mainly for rod and reels in a combo. A 1-year warranty is good, some even give you a 4 or a 5-year warranty. The more the warranty you have, the safer you are. The final thing on the checklist is the price. Pricier combos aren’t always better. As we’ve shown you the reviews, a fly fishing combo under 200 dollars can be perfect for personal use. If you are someone who’s a professional angler, then you might want to purchase the rods and the reels separately. Fly fishing combos are very useful for beginners. They don’t have to manually match the rod with the reel and they get a full fishing kit for an affordable price. There are many types of combos, these reviewed best fly fishing combo under 200 in this article are carefully selected to fulfill the needs of any new angler. There are certain factors like performance, price, built, warranty and included items that should be judged before buying a combo. In conclusion, we’d like to wish you all the best for your fishing endeavors with fly fishing combos. Q. What does a fly fishing combo include? Answer: A fly fishing combo is basically a fly rod in combination with a package that includes the fly reel, the fly line, and backing. These four are the basic and the most important things that are relevant to fishing. Other items are also included in a fishing combo. They are a rod tube, flies, leaders, and tippets. a fishing vest, a net, fly boxes etc. Sometimes, you’ll even see fishing gear thrown into the mix. It mainly depends on the price and the manufacturer. Q. What Is The Advantage Of Having a fly fishing combo? Savings: If you buy individual items then you’ll probably spend a lot of money. Buying the items together can save you up to 15% normally. Most manufacturers even provide extra discounts and in such case, you can save up to 25% which is a pretty sweet deal. Ease of Use: When you purchase a combo, your fly reel will already have the fly line and the backing spooled on the reel. This saves you a great deal of time and you don’t have to put them together yourself. Match: The reel matches with the rod. The fly line goes with the reel and is perfect for your rod. What more could you ask for? This is probably the main feature of a combo pack. Everything is matching and that saves you time. Balance: The matching rod and reels have a balance that makes it much easier to balance the rod. The rod will not tip forward or backward because of the reel as they’re perfectly compatible with each other. Q. What are the disadvantages of a fly fishing combo? Answer: Many times, a fly fishing combo will cut corners here and there. For instance, it can have a great rod performance but a fragile build quality. Other times, both rod and reels are nice but it won’t have other items included. Some will have a warranty but the performance won’t be up to par. This makes it a slippery slope. This is why many experienced fishermen don’t really buy a fly fishing combo.